This past weekend I enjoyed leading a group through their first fused glass plate making experiences in at Wired Designs Studio. 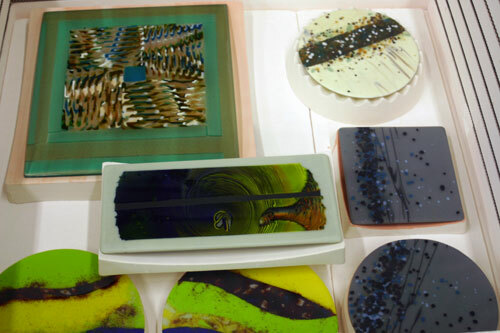 Several of the students had already been exposed to creating components perfect to include in custom plates and platters in October's Liquid Glass workshop. 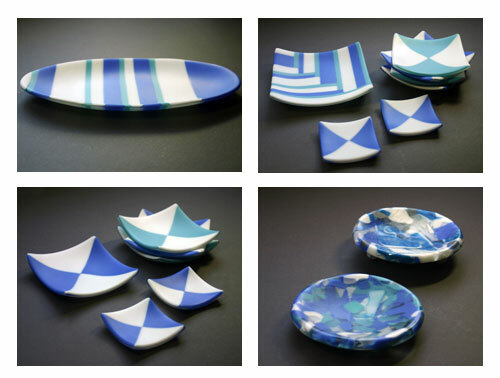 With this in mind, I demonstrated the special considerations that should be taken when including these custom design elements by using a progressive pattern bar from an August workshop to make a large platter. 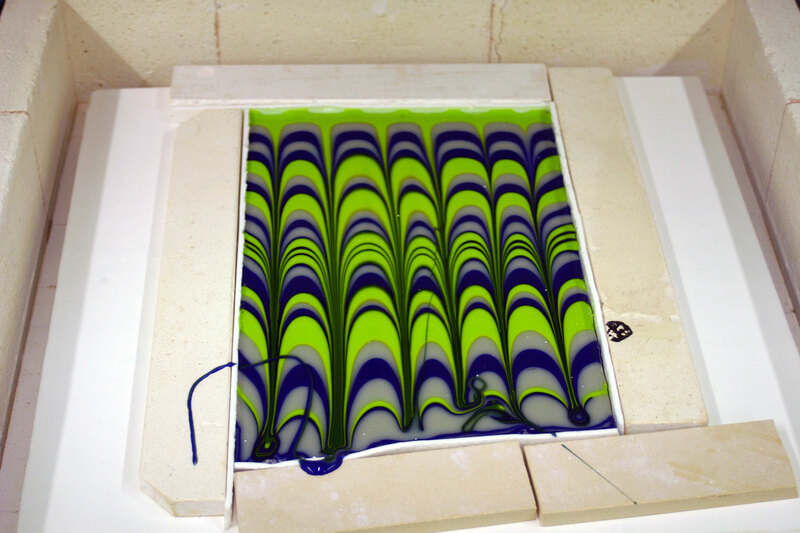 Above, my demo from class still in the kiln after the first firing. 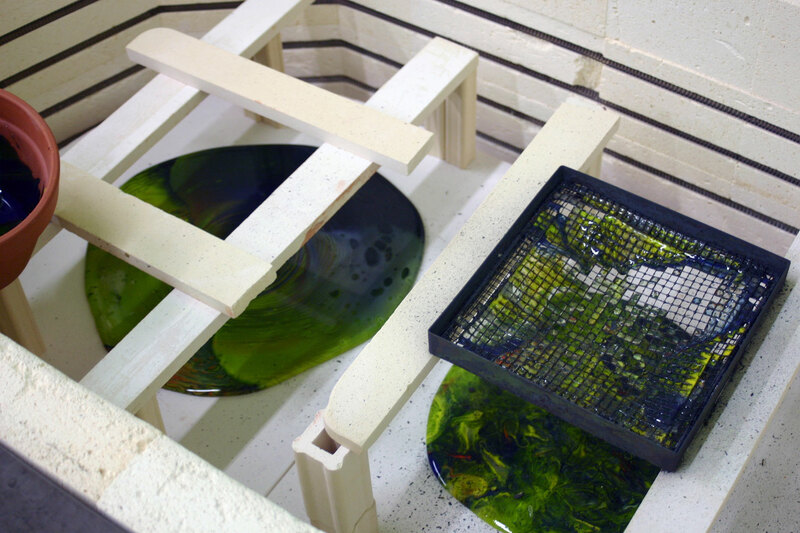 In additional to learning how to create and fire their glass tiles, everyone received hands on experience in coldworking. Using a lapidary wheel they ground and beveled the edges and then sandblasted the surface to ensure a clean finish. The well crafted tiles where then slumped into their final forms. Below are every one's pieces coldworked and ready for their final kiln firing. Everyone did such a great job! I can't wait to see how they all turn out and what they do next. This has been a very busy year. At times it felt there has barely a moment to breath. So today I am grateful most for a day of rest. 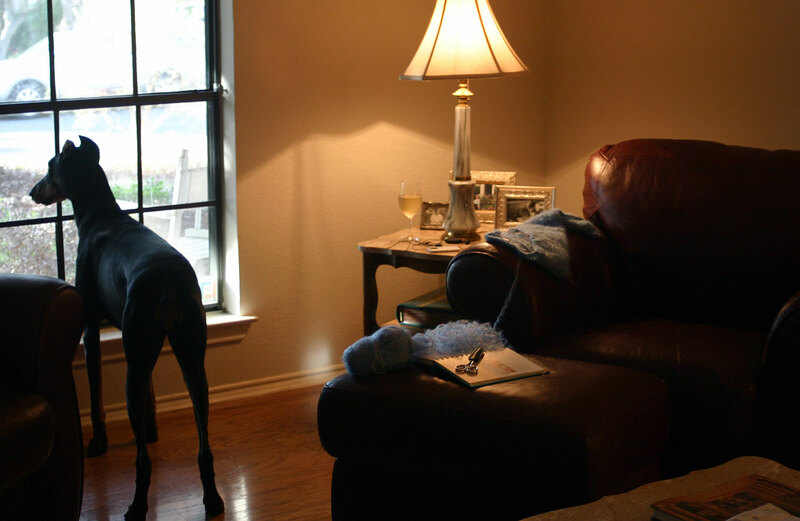 To sit quiet in my home with a glass of wine. Hands occupied with crochet. My mind absorbing nothing more then the ideal details from a Selected Short. In the other room, the Dallas Cowboys play. Soon the smell of roast duck will begin to waft from the kitchen. Like anything else this day will not last. While it does, I will enjoy it fully and give thanks. May you also have peace this holiday. Last Thursday as I drove home from work, I became hypnotized by the magnificent full moon which loomed large in the evening sky. It commanded your attention and dwarfed everything else on the horizon. Driving down the highway in the middle of rush hour traffic, I found myself in awe of nature. Later that evening, I was loading the kilns and there was a small corner of the shelf still empty. I hate running the kilns if they are not full. It's like running the washing machine for just one outfit when you could have put in a whole load, also a pet peeve of mine. It just seems like a waist. So with the moon still large in my mind, I gave myself a few minutes and a little bit of glass to just play. It was good to do something not because it might sell or as a demo for a class but just for fun. A couple days later my seven year old niece and I were riding in the car when she pointed at the moon as said "look aunt Nicole it's just like your moon". That brought it all full circle and made it all worth while. 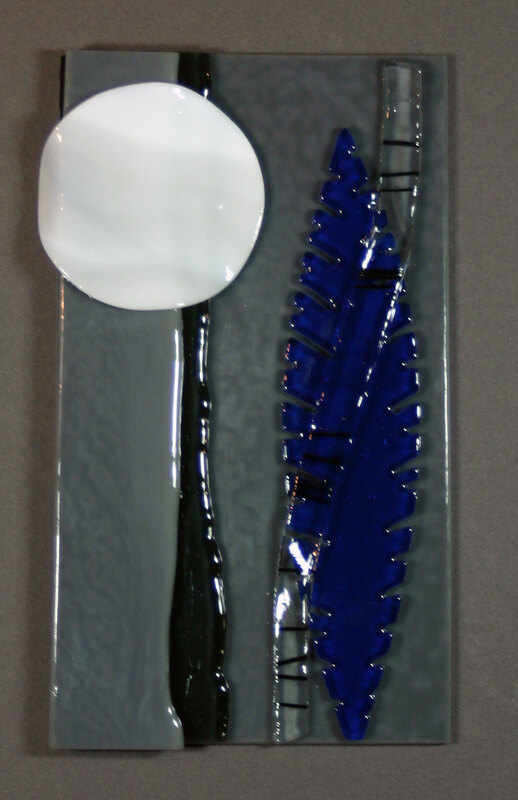 The San Antonio Glass Art Guild (SAGAG) is excited to present visiting artist Johnathon Schmuck. While here in San Antonio to teach Rock 101 at Wired Designs Studio, Johnathon will be the featured presenter at the SAGAG general meeting. Johnathon is a long-time supporter of the SAGAG having done a number of exciting and educational presentations for us in the past. We look forward to seeing him again. The meeting begins at 6:30 with a half hour to provide an opportunity to say hello to Johnathon and network with glass guild members. At 7pm we will conduct or general meeting followed by our feature presentation. Meetings are open to public. Visitors are welcome. 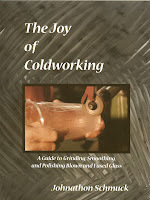 Johnathon Schmuck is the author of "Joy of Coldworking". 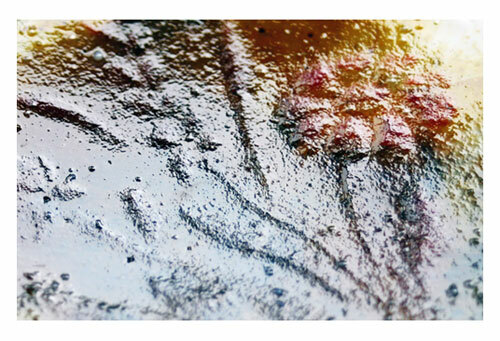 Illustrated with color photographs of processes, equipment, and works of art, this extensive publication on coldworking techniques is a must have resource for glass artists. I never hesitate to recommend this book to students and fellow glass craftsman. Regardless of experience level this book as something for everyone. November 17th is your chance to meet the author. Don't let this opportunity pass you by. I decided to post some rich golden colors of my own in honor of the season. On the left, a 6.5 inch shallow bowl with floral imagery. On the right, functional 5 inch square plates in amber and vanilla. After two full weeks of feeling pretty darn miserable, I finally acknowledged defeat and went back to the doctor. On the right meds to attack my allergies and in just two days I'm starting to feel like myself again. 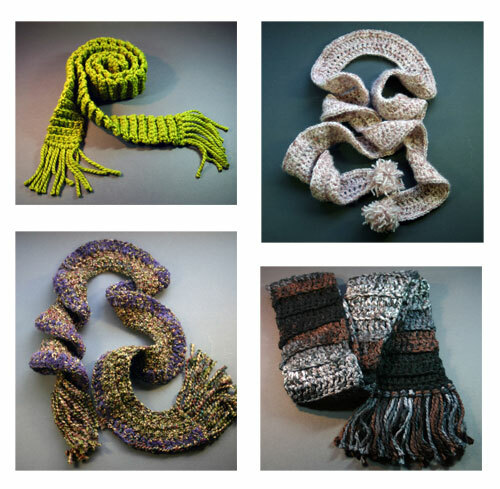 What does that have to do with scarves? Well my old self spent this evening coldworking glass and loading kilns not curled up on the coach crocheting scarves. So this recent little run on scarves is not likely going to last. You can grab one of these just in time for winter. Guaranteed no one else will have one exactly like it. Now if you'll excuse me, I'm going to try to load another kiln with dichroic glass jewelry before Uptown Art Stroll. So much to do and so little time. 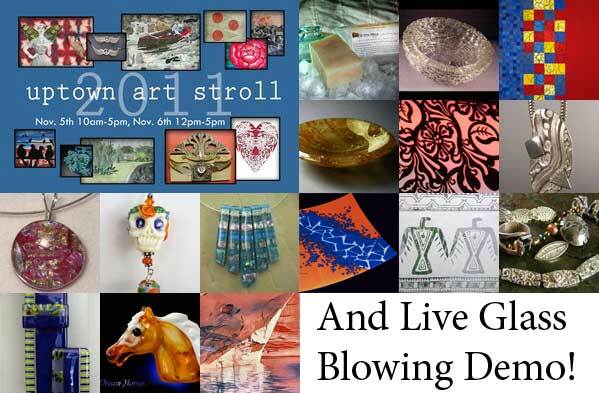 Uptown Art Stroll, in the historic neighborhood of Olmos Park Terrace, has continued to grow in popularity and importance becoming a can’t miss event for art collectors, historic neighborhood aficionados, budding artists, and those who appreciate and support San Antonio’s unique art scene. This two day event gives you access to over 50 artists working in a variety of mediums at 21 locations throughout Olmos Park Terrace. Olmos Park Terrace is in the center of San Antonio located between McCullough and San Pedro avenues, south of Basse Road and north of Hildebrand. Each location will be numbered and have a corresponding sign to make identification easier. Parking is available throughout the neighborhood. Visitors will be able to catch a RiverCity Pedicab to make getting from one end of the Art Stroll to the other even easier. RiverCity Pedicabs are provided by the artists participating in the Art Stroll and the Olmos Park Terrace Neighborhood Association (tips are appreciated). The number to call for one to pick you up is: 279-7306. 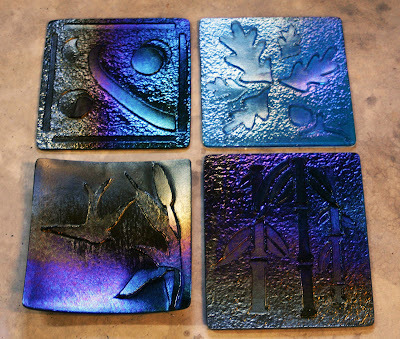 There will also be hot glass demonstrations by Dragon Fire Studio, Larry West . If you have never seen a glass blower at work this is something worth seeing. 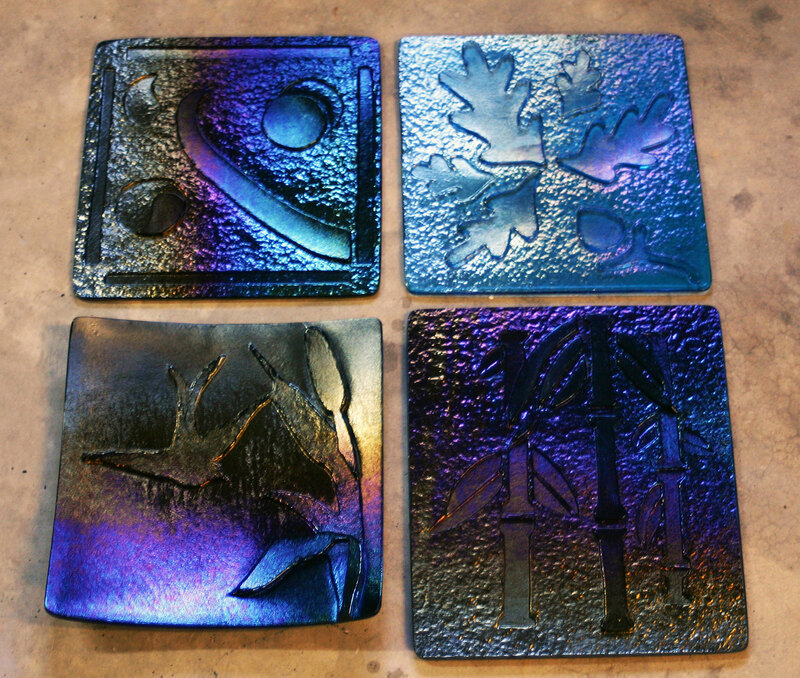 October included several workshops which I particularly enjoyed facilitating including Kiln Carving at the Kerr Arts and Cultural Center (KACC) and Liquid Glass at Wired Designs Studio. In Kiln Carving at the KACC students learned to sculpt in glass using time, temperature and gravity as their your tools. 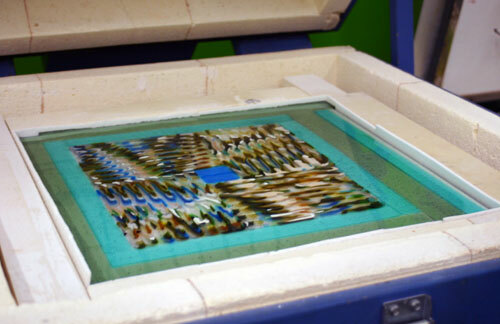 They designed and created bas relief images and textures in fiber paper which were used to form the impressions in glass. I enjoyed the opportunity to meet and talk to a fascinating group of students including one who was working with glass in the flame and a fellow Artisan's artist who typically works in clay. Just this past weekend was a Liquid Glass workshops at Wired Designs. Students learned techniques which all take place at kilnforming temperatures from1600-1700 degrees Fahrenheit including combing/raking, pot melts, wire mesh melts and high-fires. My favorite part was watching them work as a team through the combing/raking process. They did such a great job!